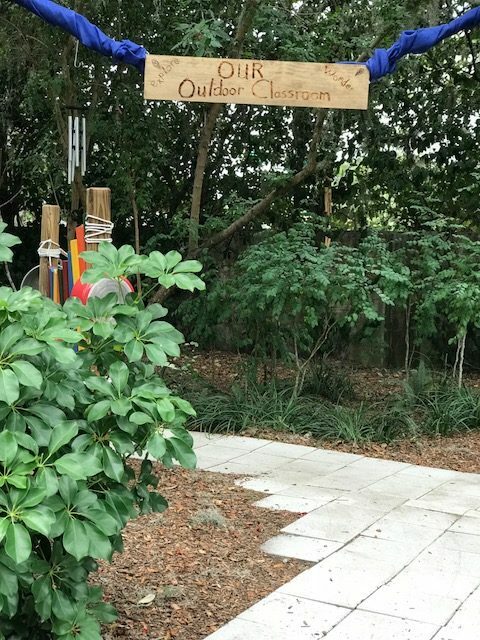 In 2013 after attending a Nature Explore training we began changing our outside child care area from all plastic, bright colored items, to more natural colors and items. 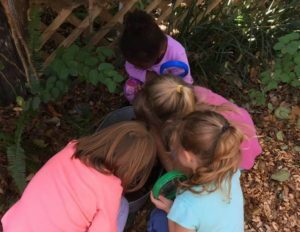 Now we have “centers” or areas outside instead of only gross motor areas. I enjoy more natural textures and colors, it is more inviting and encourages exploration and imagination. Many of our items are homemade or donated by our child care parents, such as the wooden xylophone, block table and mud kitchen. 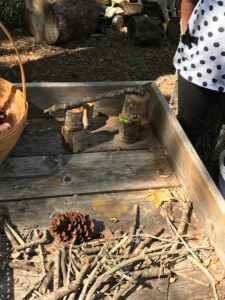 I get excited when I see that someone has cut a tree down and must stop to get a few pieces for making more block building pieces, or for tiny tree cookies to write letters, numbers, shapes, etc. to be used inside or out for activities. While changing areas outside we built a toy storage shed with crate bins that even the children can get out to help set up the different areas. Living in Florida means we have humidity, rain, and hot sun so we put a little more thought into storage and set up. 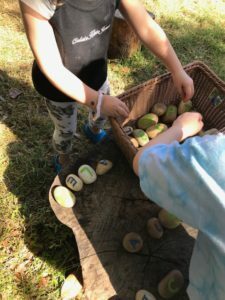 Our crates have music area items including scarves and cloths for the teepee or expression, magnifying glasses, big and smaller nature blocks, sand and water toys, balls, baby dolls, and of course the storage for trikes and ride-ons. Most of our outside nature area feels very natural being under 10 trees, with a grassy area to the side for balls, hoppers, running, etc. and surrounded on the outside by our butterfly garden and vegetable garden. One of the favorite areas is the play garden under the left copse of trees which has larger bushes and plants that they like to explore. 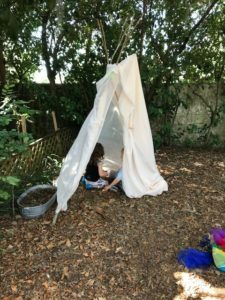 We have recently added the Teepee beside the play garden. The mud kitchen is a favorite, they can work with mud, flower petals, etc. exploring the textures, smells, and more. Beside the mud kitchen is the Gathering Area/stepping logs, another favorite. Directly under the right copse of trees is the Messy Materials Area (building area) with larger stumps to pick up, roll, or walk on, and the block table for larger and smaller tree cookie blocks. The Messy Area (art) is also under this copse of trees and has picnic tables for picnics, relaxing, etc. In 2017 the child care parents helped us install the trike trail to ride the trikes and other ride-ons around. Inside the trike trail we have our noisiest area, the Music Area. 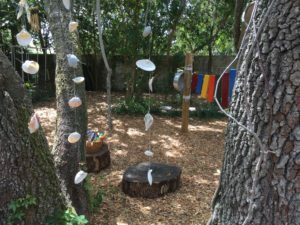 The children love the colorful wooden xylophone with the pots hanging on the posts from the sides, surrounded by wind chimes and a seashell art/wind chime with great texture and appeal. On breezy days it really sounds delightful. The sand area is tucked on the inside of the trike trail as well. Since we tend to spend a long amount of time outside we needed a reading area for relaxing. A simple blanket and bag of books in a side grassy area works nicely.